I actually won an award in the Middle Earth Fanfiction Awards for 2011. So I'm going to take today and bask, and tomorrow I'll be back to normal - working hard. 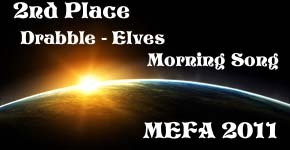 My drabble "Morning Song" (that's a story of 100 words) placed second in the Drabble-Elves category. OK, that's enough about me, many of my friends placed numerous times and their wins were far more deserved than mine. So my sincere CONGRATULATIONS go out to all of the winners as well as all those stories that were nominated. Well done!